Writing In The Crosshairs: NEW PRIZES! NEW WAYS TO WIN! NEW WAYS TO GET THEM! 1.) MICHAL WHELAN'S AUTOGRAPHED DRAGONFIRE PRINT! HOW? I will have a drawing when the 40th copy of THE LEGEND OF VICTOR STANDISH is bought. 2.) 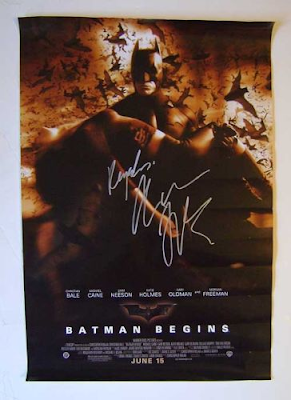 BATMAN BEGINS MOVIE POSTER AUTOGRAPHED BY CHRISTIAN BALE! HOW? I will have a drawing for this when VICTOR sells the 75th copy. 3.) 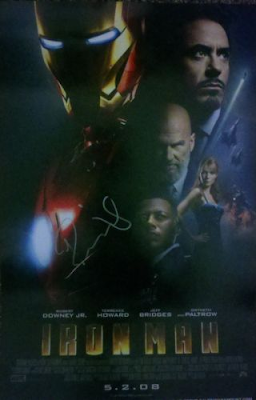 IRON MAN MOVIE POSTER SIGNED BY ROBERT DOWNEY, JR! HOW? 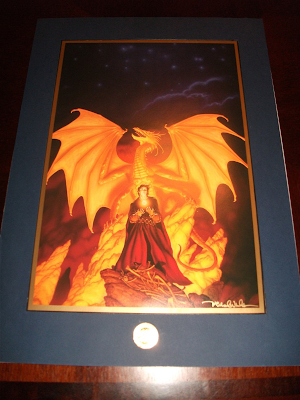 I will have a drawing for this poster when VICTOR sells his 101st copy! AND DON'T MISS OUT ON THE CHANCE TO WIN ONE OF THE FIRST KINDLE FIRES!! Amazon's billionaire Chief Executive Jeff Bezos unveiled the Fire at a lower-than-expected price of $199. Bezos said Amazon is making "millions" of the tablets, without being more specific. However, he urged customers to pre-order the device early. "When Bezos quipped that people should get their pre-orders in quick, that wasn't just a sales pitch," said Brian Blair, an analyst at Wedge Partners. "That was him warning this will sell out." When the first Kindle came out in 2007, Amazon hadn't made enough and the e-reader sold out in less than a week. You could win this when everyone else is hitting eBay, looking for the elusive units! Just write a review of THE LEGEND OF VICTOR STANDISH and get FIVE entries to win! Awesome :) I'll buy the book, but I'm not sure when I'll get to read it. I have 4 or 5 of your novels. Lately I feel like a hoarder; buying books and tucking them away for future downtime. I really hope all your sales dreams come true Roland. And I hope I get to see Sherlock Holmes in the theatre. Robert Downey Jr is quickly becoming one of my favorite action hero's. Hmm, did you get moved back into your apartment? Yes, I'm trying for awesome prizes to draw people to LEGEND, hoping once they read of my novels, they will want to read one or two more! Hey, I can dream! It is very nice of you to drive your carless friend to CVC. Thanks to vandals, I was carless for a time. I know only too well how it feels. Like you, I buy more books than I have time to read. The latest is the biography of RIN TIN TIN and the man who found the pup on the battlefields of World War I. The NY Times review absorbed me so that I tweeted about it! I timed this contest to build to the release of the Kindle Fire and the Christmas rush of Kindles being bought as presents. Those new owners have to read something, right? And I now have a nice backlist of novels to choose from. Now, to get them to the attention of new readers! As John Wayne said in HONDO : "It's nice to have a plan." I got to see the first SHERLOCK HOLMES in the theater on Christmas Day with only the ghosts of the League of Five with me. I enjoyed the theater experience. I, like you, hope to be able to see the sequel in the theater as well. Some films just need to be seen on the Big Screen. Like you, Robert Downey, Jr. is becoming one of my favorite action actors. Alas, I am still in exile, sleeping on the floor on a slowly leaking air mattress. And I am still at work, waiting for a hospital to call me back. After finally allowing myself to snitch some money from the housekeeping to buy your book yesterday, I realised I already had it :-) How I missed a book by you I don't know, but Roland, I loved it. I couldn't go to bed until I finished it in the small hours, (after shedding a tear or two). Expect a review tonight or tomorrow. Honestly? I think it's the best of yours I've read. Life has a way elbowing our memories aside to deal with the crisis at hand! Thanks for shedding a tear or two. I've been told that when Victor explains his last name and all during the end, the tears come, ebb, then come again. "You are Victor Standish, and you will find a way back to me."